A roof is a roof, right? Well, maybe to some. But certainly not to us. As middle Tennessee’s premier roofing contractors, we understand the vast difference between commercial and residential roofing systems. We understand that this knowledge is not something everyone needs. But if you are interested in learning about some of the key differences, you are in luck. 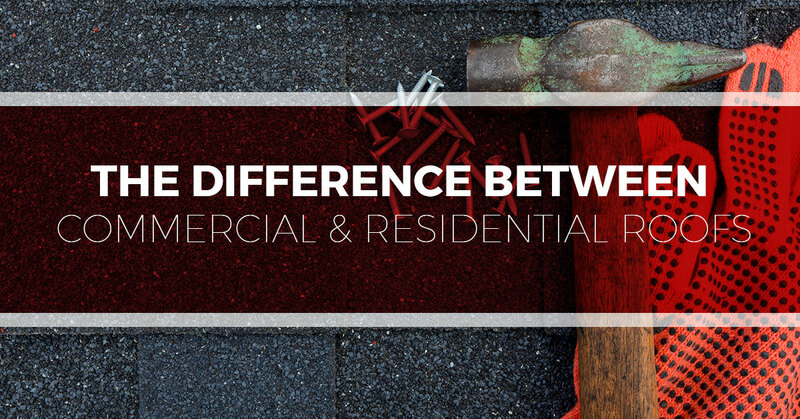 In today’s blog, we at Tim Leeper Roofing would like to offer a general guide to the key differences. If you are in need of commercial or residential roofing services, contact one of the best roofing companies in The Volunteer State—Tim Leeper Roofing. We not only offer an array of roofing services, but we also offer our clients claims assistance. Learn more about our services and contact us today to learn more. One thing commercial and residential roofing systems have in common is that when damage occurs, repairs and replacements can be expensive. And to truly remedy the situation—and get a new roof that you can depend upon for years and years—it is essential to not only have industry-leading materials but also a crew of roofing contractors who have the experience and expertise to install your new roof properly. These are some things that both types of roofing systems have in common. Now let’s get into some of the key differences. The materials used on residential and commercial roofs differ greatly, both in their cost and longevity. These differences can become even more pronounced when you take into account any variance in weather conditions and settings. For homes, the most common type of roofing is shingles, tiles, and slate. For commercial properties, on the other hand, the roofs typically consist of a single-ply membrane or a modified bitumen. As you might already have guessed, the reason for these materials is because they can cover a large surface area—in the most efficient, affordable, and long-lasting way possible. Metal roofing is another common type of roofing material for both homes and large commercial properties. While all installations require an experienced roofing contractor, there are a number of key differences between the two roofing systems. Perhaps the most apparent and important to clients is the amount of time it takes to install the different types of roofs. Depending on the size, installing a new commercial roofing system can take weeks, whereas a new residential roof replacement can be done in a few days. As you can see, not all roofs are the same—in short: residential roofs tend to be easier to install, maintain, and are more affordable. At Tim Leeper Roofing, it would be an understatement to say that we know that not all roofs are the same. Beyond, of course, understanding all the differences in materials, techniques, and equipment, we understand that all of our clients are different, and should, therefore, not be treated the same. This is why we take pride in working closely with our clients to tailor the best possible roofing solution for their residential or commercial property. Looking for one of the finest roofing companies in Nashville to handle your roofing services? Well, you’re in luck, we’ve got our number right here: 615-553-2782. We can handle all of your commercial roof services—low slope repairs, replacements, and coatings, as well as metal roofing and more! And we can also take care of all of your residential roofing services—shingle repair and replacement, roof coatings, as well as nearly all general residential roof repairs!